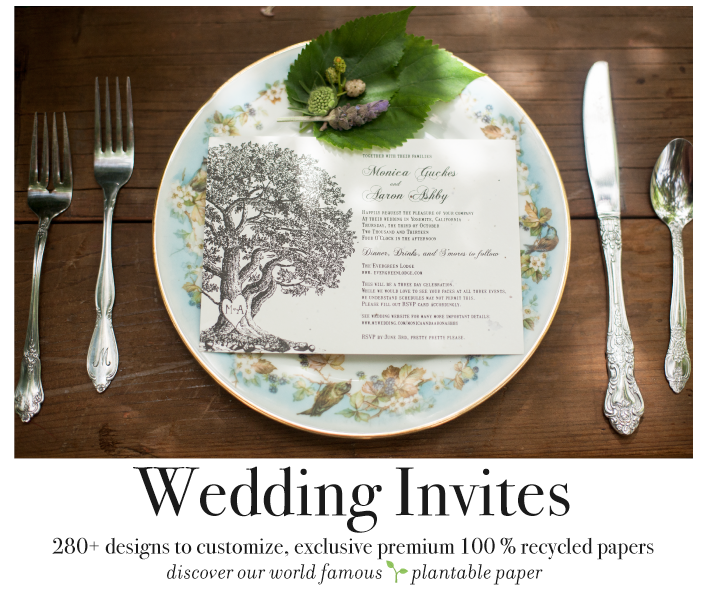 exclusive recycled papers -Home > Unique Wedding Invitations > Search for "watercolor"
Discover our unique wedding invitations, which grow wildflowers  or garden herbs (such as basil, chives, tomatoes or lettuce). Your guests will be amazed when they find out they can grow your invitations in their garden. With exclusive designs, ForeverFiances specializes in nature themes, rustic style with flowers, trees and outdoor scenery. Our planet is precious. We even ensure that our themes represent nature at its best. Be it a garden wedding, or a winter wedding, our designs will bring out the nature in it. In the spirit of keeping green, we only offer premium 100% recycled paper. Whether you choose premium paper or seeded  paper, both are 100% recycled. Unique Wedding Invitations at ForeverFiances. 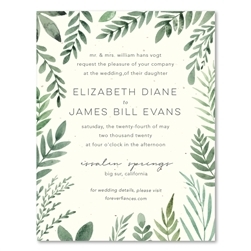 Find green wedding cards, tree wedding invitations & elegant wedding stationery. Printed on 100% recycled paper. Famous to be most eco-friendly, with seeded papers, plantable into wildflowers. You can provide your guests with a breath of fresh air, literally in this case, with these plantable wedding invitations. Make something new and rich full of life with colors that match your personality while giving the day a warm effect. Knowing your guests? personal tastes, you can even choose to personalize the seeds in the invitations to match what each guest or family likes. Be careful though to only choose seeds of plants that grow in your area code to avoid loss of seeds.